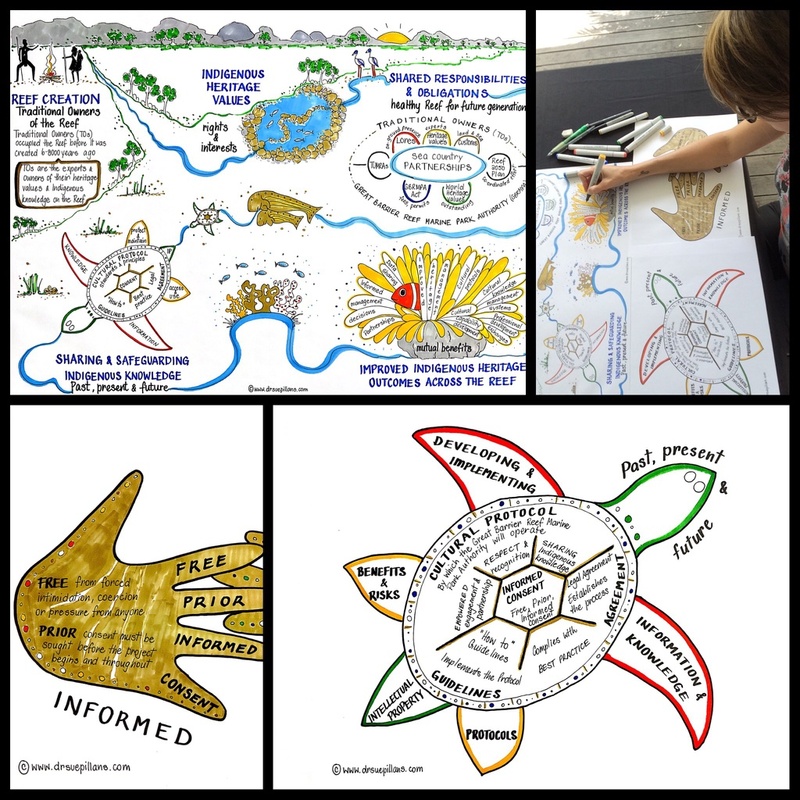 I am delighted to share my latest creative collaboration which is with an Indigenous business, Markwell and Associates, to illustrate a series of visuals to accompany the ‘Safeguarding Indigenous Heritage and Knowledge’ project for the Great Barrier Reef Marine Park Authority (GBRMPA). My role as a creative and visual communicator is to ‘draw out’ the key messages of projects to suit the content, audience and delivery mechanisms. In this case I was asked to incorporate both Aboriginal and Torres Strait Islander elements into the drawings which will be shared with a diverse audience including GBRMPA staff, GBR Traditional Owner groups and other Reef stakeholders (in person, online and in documentation). And I’ve had such a wonderful response to my visuals from both my clients and Reef Traditional Owners including the appreciation of my creative energy in the process! You can see more of my visual storytelling with Indigenous Communities. You can ‘sea’ more of my creative collaborations via Infographics & Illustrations. You can also dive in with me and follow my creative journey via my alter ego Dr Suzie Starfish and @suepillans on Twitter and Instagram.